• PAMPER: We created our Mouse Wrist Relax to help you relax and feel happier while working at your computer or laptop. Now's the time to treat yourself and replace that drab chemical filled gel pad with an eye catching naturally filled piece of soft sculpture that's as functional as it is attractive. You're worth it! • QUALITY: We believe that when something is handmade and there is passion, energy and attention paid to each piece, you get originality and quality you can't find in mass-produced products. Every Keyboard Wrist Rest is hand crafted in our cozy upstate New York studio from the finest Satin Brocade and Crushed Velvet available and then hand filled with all-natural flax seeds and optional all-natural lavender blossoms. • PRIDE: We know there are a lot of Mouse Wrist Rests on the market and there are many cheaper priced versions as well, but when you purchase from Candi Andi you're supporting a woman and veteran owned American handcraft small business. We hire stay-at-home and single moms to assist us with our hand-crafted production. Best of all: We are proud to provide you with that rare opportunity to purchase something that isn't made overseas. 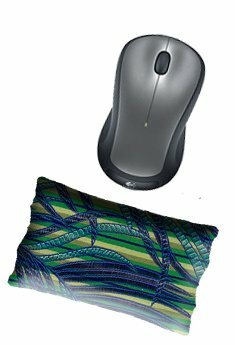 • LOVE: We LOVE to make Mouse Wrist Rests! Candi Andi has been hand crafting home spa products and decorative home décor pillows for over 18 years and we put our love into every item we create. • GRATITUDE: We are very THANKFUL for every single customer and always humbled by every order we receive. We hope you'll be the next customer to join the Candi Andi family. .